This content is not provided or commissioned by the issuer. Opinions expressed here are author’s alone, not those of the issuer, and have not been reviewed, approved or otherwise endorsed by the issuer. This site may be compensated through the issuer’s Affiliate Program. We think the Capital One® VentureOne® Rewards Credit Card is a popular choice for travelers who may want a low-cost credit card that earns miles on every purchase. The card is nothing fancy – it doesn’t boast the highest rewards rate or the largest bonus offer on the market. That said, the price is right. It’s a solid card with no annual fee, and it nets more than the one-mile-per-dollar many other $0 annual fee rewards cards offer. We asked our Credit Sesame members to vote on the most useful features or benefits of the Capital One® VentureOne® Rewards Credit Card. Here are their top three responses. Based on a survey completed by 500 randomly selected Credit Sesame members in July, 2017. Members could vote for more than one feature. With this credit card, earn 1.25 miles per dollar spent on every purchase, every day. There is no limit to the number of miles you can earn, and miles won’t expire for the life of the account. To be considered for this card having a credit score of good to excellent is a good start. Additional factors from your credit history and your application will also be considered in the issuer’s decision whether to extend credit. Having a credit score in a particular range is not a guarantee of approval. Let’s cover some of the benefits offered by the Capital One® VentureOne® Rewards Credit Card so that you can decide whether it meets your needs and fits well with your spending habits. There are two key rewards for this card that we want to analyze in detail. We think the bonus offered by the Capital One® VentureOne® Rewards Credit Card may look modest compared with some other current bonus offers. That doesn’t mean you should rule this card out. But to be fair, let’s look at the bonus offers for qualifying new cardmembers on a few other cards. *Editor’s Note: The information related to the JetBlue Card has been collected independently by CreditSesame.com and has not been reviewed or provided by the issuer of this card. The key detail to notice here is the minimum spending requirement for qualifying new cardmembers to earn the bonus offers. We think that the Capital One® VentureOne® Rewards Credit Card is a strong contender for any consumer who may not be able to reach a higher spending threshold. Indeed, if you only reach $1,000 in spending on purchases within 3 months from account opening, you get a bonus of 20,000 miles, equal to $200 in travel, from the Capital One® VentureOne® Rewards Credit Card. Earn Miles: For travel purchases made with the card, redeem your miles as a statement credit toward the cost. Those redemptions must be made within 90 days from the date your travel purchase posts to your account. Transfer miles to over 12 leading travel loyalty programs. Miles won't expire for the life of the account. Auto Rental Collision Damage Waiver: At no additional cost receive coverage for damage due to collision or theft when renting an eligible vehicle with your Visa® Signature card. 24-Hour Travel Assistance Services: Emergency replacement card and a cash advance if your credit card is lost or stolen. A benefit provided by Visa®. Let’s compare two similar travel rewards credit cards to see how they stack up. We’ll compare the Capital One® VentureOne® Rewards Credit Card to the JetBlue Card since they both have no annual fee and extend a bonus offer to new cardholders with similar spending thresholds. Neither the JetBlue Card nor the Capital One® VentureOne® Rewards Credit Card charge a foreign transaction fee, like many other travel credit cards do – so it’s a tie on that point. We all know that the smartest way to use a credit card is to never carry a balance. But lots of us do from time to time, so the Annual Percentage Rate (APR) is an important consideration that should not be overlooked. 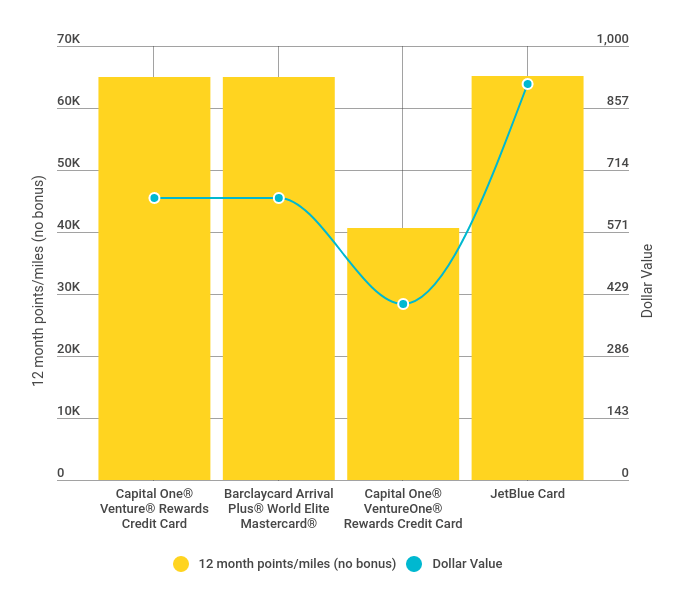 Let’s compare the Capital One® VentureOne® Rewards Credit Card with the others to see how they stand up when it comes to credit card APR on purchases. Of the cards included here, only the Capital One® VentureOne® Rewards Credit Card offers a 0% introductory APR on purchases for 12 months, 14.24%-24.24% variable APR after that. You might not think a difference of 1% to 4% variable APR for purchases is significant, but it is if you carry a balance. Consider this. Let’s say you’ve got $3,000 in credit card debt and you can afford to pay $50 per month and there is no annual fee and you don’t make any other transactions on your card – purchases, balance transfers or cash advances. At 14.24% variable purchase APR, you’ll make 106 payments and spend an estimated $2,276 on interest charges. The same scenario with a 18.24% variable purchase APR will take you 162 months and result in an estimated $5,055 in interest charges. A difference of four percent can translate to over four extra years of payments on the same debt! The Capital One® VentureOne® Rewards Credit Card is the winner if you plan to carry a balance on your credit card, providing you are eligible for the lower tier rate. Calculation is intended for illustrative purposes only. Results are estimates only and should not be viewed as being applicable to your specific circumstance. We imagine that some folks don’t mind paying hundreds of dollars in annual fees to own a credit card, while plenty of consumers are dead-set against paying any amount in annual fees just for the privilege of holding that piece of plastic in their wallet. And then there are those who fall somewhere in between, looking for a reasonable annual fee in return for something of value. The bottom line is that it’s uncommon – but not impossible – to get valuable, tangible rewards with no annual fee. Consumers also want to know about balance transfer fees so they can estimate the savings they might gain from taking advantage of an introductory APR offer on balance transfers. Let’s look at our cards to see what they cost. Both the Barclaycard Arrival Plus® World Elite Mastercard® and the The JetBlue Card offers 0% introductory APR rates on balance transfers, for the first 12 billing cycles for each balance transfer that posts to your account within 45 days of account opening. Both cards also have a balance transfer fee of either $5 or 3% of the amount of each transfer, whichever is greater. For a consumer looking to save money, the JetBlue Card may edge out the competition since it has no annual fee. Let’s take a look at what some of our members had to say about the Capital One® VentureOne® Rewards Credit Card and their journey from application to usage. Please note, the features these members mention in their comments may no longer be available for the particular card – and their experiences may not be the same as the experience of other card members. Q: When did you get this credit card? A: I got this credit card last year in December. Q: Why did you apply for this credit card? A: I applied to use it for my Christmas shopping. Probably not the best reason to open a card, but I heard it had good rewards for travel, plus the bonus offer was hard to pass up. You get 20K bonus miles when you spend only $1K. Most credit cards require a higher spending limit (even though it also has higher bonus points), but this one fit my budget and what I was looking for. Plus it has no annual fee. Q: What do you use it for on a weekly or monthly basis? A: I use it for everything, so that means it’s used on a daily basis for things like food, gas and grocery shopping. Q: Which feature was most useful? A: I liked the 1.25 miles on every purchase. I don’t have to keep on top of changing categories each quarter. It’s straightforward and easy. I also liked the easy tool on Capital One’s site that shows you how much you need to spend to earn a certain amount of miles each year. Very helpful! Q: Which feature was least useful? A: I can’t think of anything that wasn’t useful. Q: Do you recommend this credit card? A: Yes, I recommend this to all of my friends and family because it’s so easy and the benefits are pretty good. I do have friends with bad credit, so I don’t think they were able to get the card even though they applied, but they are working on increasing their score so they can apply too. Really good card! A: Wanted a good rewards card with no annual fee. A: I pretty much use it for everything except my monthly bills. So restaurants, Amazon, groceries, gas. School books and school supplies. I also had to get some work done on my car. I try to keep it paid off but right now I am paying down the auto repair. A: No rotating categories. I have also used the auto rental insurance waiver. Also I set my payment date to what I wanted. A: Travel “upgrades.” Mostly offered in ways that I could not use. The “premium benefits” are at high dollar hotels I will never go to in my life. A: Yes. Most rewards credit cards give you one point per dollar but this one is 1.25 miles so over time the additional quarter percent adds up. A: I am planning a trip to France and Spain next spring and I wanted the bonus as well as earning miles for all purchases. A: I use this card for everything that I can’t get a higher rate on. So when I can’t get 5x back on gas from my other credit card, I use this one because the other card drops down to 1 point but this one gives me 1.25. A: No foreign transaction fee!!! I learned this the hard way. I went to London about five years ago and didn’t know until I got the bill that my credit card was charging me an extra 2% every time I used it. So this time I was not going to apply for any card that charged for foreign transactions. A: I guess the travel insurance. Chances are pretty remote that I will ever have a “covered” loss. A: Sure. But I would like to know if they will lower my APR as my credit goes up. The vast majority of us spend on purchases at grocery stores, and most of us eat out and buy gas, too. If you’re researching the Capital One® VentureOne® Rewards Credit Card, we presume you also like to travel since its rewards redemption value is best when redeemed against qualified travel purchases. You can also redeem your miles for cash in the form of a check or account credit, gift cards and more. Rates for these other redemption options vary and are subject to change without notice. Let’s see how the cards compare when it comes to spending on purchases made at grocery stores, restaurants, on travel, and on gas at gas stations. Remember, each card’s potential has to be weighed against its cost. The spend includes qualifying for extra points for specific spending if applicable, for example, with the JetBlue Card you can earn 3X points per dollar spent on qualifying JetBlue purchases. For more details about how we value points and miles, click here. Annual fees are not considered in the final dollar values. It may be useful to know which credit card is best in terms of total points or miles and dollar value after one year of typical spending, primarily focused on purchases made at grocery stores and restaurants. The Capital One® Venture® Rewards Credit Card edges out the others on overall miles and JetBlue Card TrueBlue points earned for spending. With the Capital One® Venture® Rewards Credit Card you earn 2X miles per dollar spent on every purchase and qualifying new cardmembers have an opportunity to earn a one-time bonus offer of 50,000 miles once you spend $3,000 on purchases within 3 months from account opening, worth $500 in travel. Which card is best for traveling after one year of owning it, now excluding the introductory bonus points or miles? Since leaving a credit card open can increase your average account age over time and help you maintain a healthy credit score, you’ll need to know how hard your card will work for you beyond the first year. The Capital One® Venture® Rewards Credit Card and the Barclaycard Arrival Plus® World Elite Mastercard® are tied in terms of total points or miles earned and the total dollar value of those points or miles. The JetBlue Card, however, edges out the other cards, including those with annual fees. That’s because we included travel purchases in our calculations and the JetBlue Card pays 3X points per dollar spent on qualifying JetBlue purchases. That’s one third more than the highest earning rate on the two cards with annual fees. We don’t recommend writing off the Capital One® VentureOne® Rewards Credit Card just because the miles earned over one year are lower compared to the other card. Remember, the JetBlue Card’s points are TrueBlue points that are redeemable for travel only on JetBlue and Hawaiian Airlines. With the Capital One® VentureOne® Rewards Credit Card’s miles, however, you can travel when you want with no blackout dates and fly any airline, stay at any hotel, anytime. You can also transfer your miles to over 12 leading travel loyalty programs. If you don’t want to be restricted to just JetBlue and Hawaiian Airlines, the Capital One® VentureOne® Rewards Credit Card may provide more value. 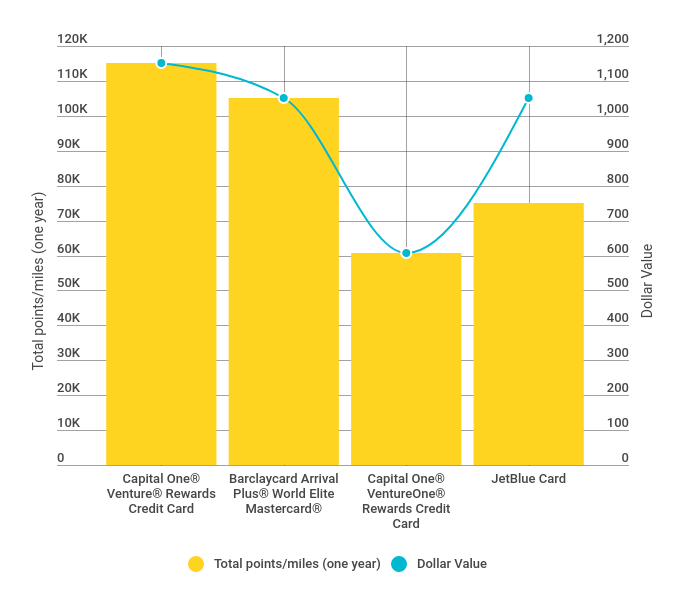 Which credit card is best in terms of dollar value after one year of spending on different categories, focusing more on the grocery store category. None of the cards on this list offer bonus rewards for spending at grocery stores, so the differences in points or miles earned are based on the rewards rate for each card. The cards that impose an annual fee starting in the second year has a higher payout in year one for heavier grocery store spenders because they offer more points per dollar. The JetBlue Card edges out the Capital One® VentureOne® Rewards Credit Card because of its tiered rewards, but again, the redemptions are more limited on the JetBlue Card. 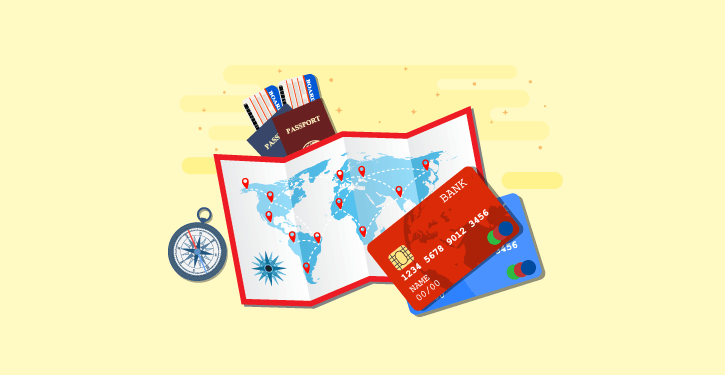 Let’s compare the basic information for these popular travel credit cards. We’ll ignore the bonus offers and just look at the ongoing value each card will provide over time. N/A 0% intro APR for the first 12 billing cycles following each balance transfer that posts to your account within 45 days of account opening. After that, an 18.24%, 22.24% or 25.24% variable APR based on your creditworthiness will apply. There is a fee for balance transfers. N/A 0% intro APR for the first twelve billing cycles following each balance transfer that posts to your account within 45 days of account opening. After that (and for balance transfers that do not post within 45 days of account opening) your APR will be 18.24%, 22.24% or 27.24% variable APR based on your creditworthiness. There is a fee for balance transfers. Balance Transfer Fee: $0 balance transfer fee Balance transfer fee of either $5 or 3% of the amount of each transfer, whichever is greater. $0 balance transfer fee Balance transfer fee of either $5 or 3% of the amount of each transfer, whichever is greater. The Capital One® VentureOne® Rewards Credit Card is the only option with an introductory 0% APR on purchases for 12 months; 14.24%-24.24% variable APR after that. It also has the best regular variable APR range, no foreign transaction fees and no annual fee. A key benefit of the Capital One® VentureOne® Rewards Credit Card is that its rewards can be redeemed against travel purchases with no blackout dates – fly any airline, stay at any hotel, anytime. Or transfer your miles to over 12 leading travel loyalty programs. As you can see, the bonus offer should never be the sole consideration when choosing a card. Also, while other cards may pay more in miles per dollar spent, those miles often come at a cost. For example, you may need to spend a certain amount in purchases on the card to earn rewards to recover the cost of an annual fee. Is the Capital One® VentureOne® Rewards Credit Card Worth It? We think the Capital One® VentureOne® Rewards Credit Card is an excellent option for folks who may want to work towards rewards for travel by spending on a card that is easy to own. The fact that it has no annual fee, pays a little more than the one mile per dollar than many other cards offer, and offers the ability to redeem miles and fly any airline or stay at any hotel, anytime, really makes it stand out among rewards cards. Alternatively, you can transfer your miles to over 12 leading travel loyalty programs. If you think the Capital One® VentureOne® Rewards Credit Card looks like a good fit for you, click here to learn more. Do check your credit score first, since this card is typically issued to applicants with excellent/good credit. As we already mentioned credit decisions are made on a variety of factors and even if you meet certain criteria there is no guarantee you will be approved. If you’re not sure where you stand, log into Credit Sesame (or join for free) today. Credit Sesame also offers a pre-qualification service for Capital One products. Just click the button that says “See if I’m Pre-Qualified” near the Capital One product offers in your member account. Although pre-qualification isn’t a guarantee of approval, it can help you narrow down your choices without impacting your credit score. If you’re interested in one of these offers you can click on one of the below Learn More links which will take you to the card details page for the offer. Independent Review Disclosure: All the information about the JetBlue Card credit card has been collected independently by CreditSesame.com and has not been reviewed or provided by the issuer of this card. The JetBlue Card credit card is not available through CreditSesame.com.